User workflows – I created workflow models of member interaction with personal medical records, including test results, allergies, immunizations, ongoing health conditions, health care reminders, past doctor visit information. The models included workflows in which the member acts on behalf of a child, a teen, and an adult family member (i.e. proxy users). 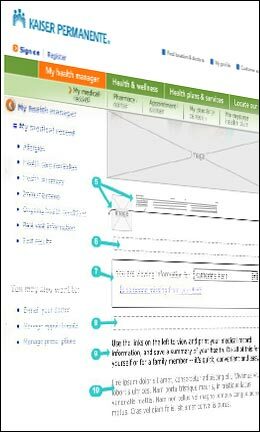 Design Challenges – Analysis of the members' common user workflows revealed that the information architecture of the feature set had to be simplified and navigation between features had to be improved. The content of electronic medical records can be difficult for users to understand, as it is often presented in medical terminology. As such, the interaction design solution needed to be intuitive enough as to be cognitively invisible. Interaction Design – Working in collaboration with product owners, engineers, editors, and graphic designers, I designed the interaction for two different approaches to a solution and created prototypes of each. User Testing – I observed, documented and analyzed comparative testing of the design prototypes (A/B testing). Design Iteration – The team chose a version based on the analysis of user testing. I iterated the design to include improvements to the model that were identified in testing. Wireframes and workflows are available on to view on the portfolio examples page with a supplied user ID and password.